Apair of Common loons nest on a small lake (in New England, we call them "ponds"). The parents await the arrival of their chick. I wait nearby in my kayak with my video camera. The chick arrives in early July, and from then to October we experience its first summer. We'll watch the tiny loon take its first swim, leave the nest and venture out onto the pond. Both loon parents watch over, feed, and teach the chick what it will need to survive on its own by the fall. In its first 2 weeks, the chick often rides on a parent's back. We'll tour the pond with the chick - meeting frogs, cedar waxwings and woodpeckers, a kingfisher, wood ducks and even a bald eagle. We'll watch the young loon struggle to devour a spiny fish and encounter kayakers trying to capture its portrait. We'll see the pond the day after Hurricane Irene hit Vermont. When other adult loons visit, the chick hides. Not all visits are friendly. As the seasons change, we'll watch the chick mature from a fluffy ball of down into a sleek, feathered juvenile as large as its parents. The story is told through images with a few subtitles and no narration to interrupt your own exploration of a loon chick's first summer accompanied by the haunting flute music of Werner John, classical guitar compositions by Antonio Calogero, and several others. Loon Chick's First Summer now available on Amazon Instant Video. 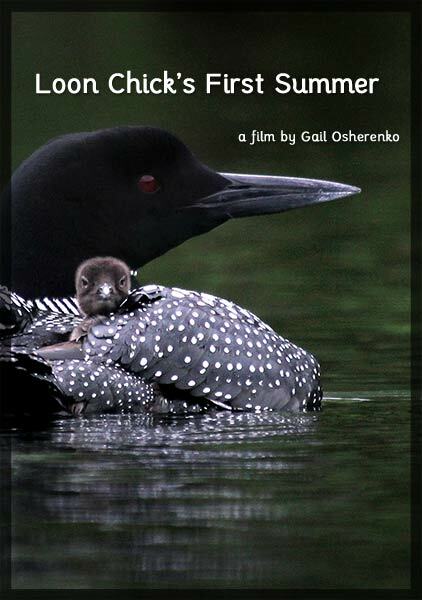 Loon Chick's First Summer is filmed, produced and edited by Gail Osherenko. Shannon Dybvig, assistant editor and webmaster. Jacket photo by Mary Holland. 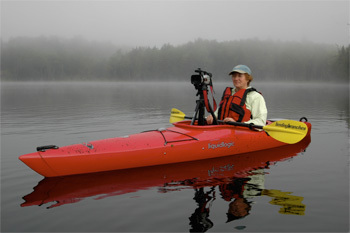 Gail Osherenko filmed and producedLoon Chick's First Summer in 2010. She lives in Santa Barbara, California and watches loons in Vermont in the summer.